Google, we know, never ceases to amaze and even with YouTube Music centers the sign. Of course, behind every free service offered to us there is a “file” of the use we make of it, which is used by the Mountain View company for commercial purposes. But most of the services that are free for us, are also of a higher level. I discovered by pure chance, while working on a YouTube channel – which kindly warned me of the news – that Google has launched in the market currently exclusively in charge of Spotify: music in the cloud. Very simple interface, already pre-compiled playlists, custom suggestions that change with use and songs related by genre, artist or other similarities. Nothing incredibly innovative in the UX. Where is the difference compared to Spotify and Apple Music? 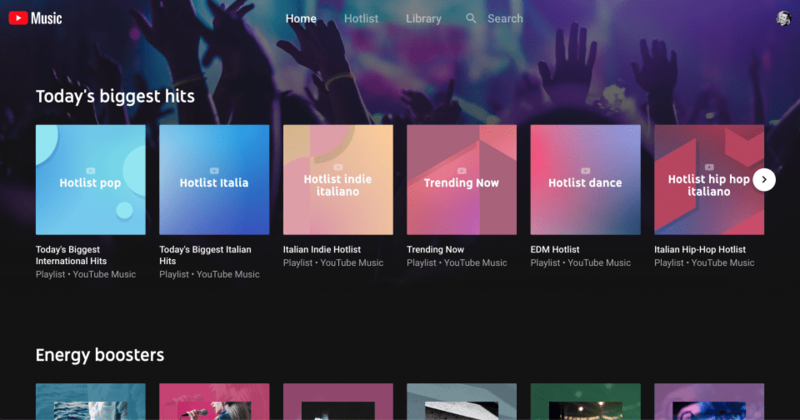 Simple: YouTube Music is connected to your Google account, so it “already knows” which music you have searched for and listened to in previous years. It seems superfluous, but this translates into more “precise” playlists, with songs that are definitely appreciated because you’ve already listened to them and YouTube knows that. Of course, we have often used YouTube as a music player, but always with the need to manually select the songs, because YouTube presented an interface designed to watch “one video at a time”. Music overcomes this obstacle and presents itself with the “click & forget” mode, ie choose the first song and then do it all. Obviously, available on Desktop, iOS and Android. And you’ve already used it https://music.youtube.com ?